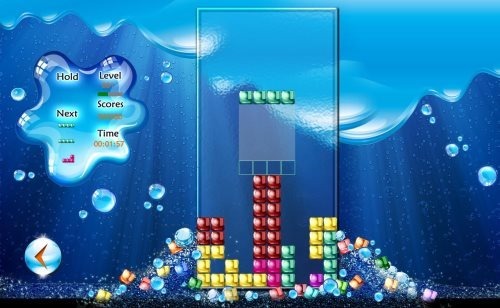 Tetris 8 is a free Windows 8 block puzzle game app where you need to create horizontal lines and survive as long as possible. Yup.. that’s the object of the game. You need to manipulate the Tetriminos (game blocks) by rotating them by 90 degrees units, or by moving them sideways. Once you create a horizontal line, it automatically disappears and all other blocks fall down. As you start solving the puzzle, it will change the level and brings you more challenging task. Ask your friends to compete in the online leaderboard, and get as much high score as you want. Go ahead and download Tetris 8 app in Windows 8 now. 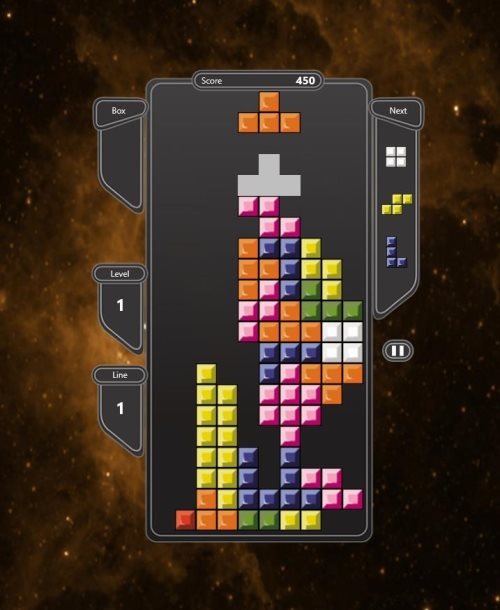 Space Tetris is another popular Windows 8 block puzzle game app. The object of the game is to create horizontal lines using pieces falling from the top of the screen. As you successfully create a horizontal line, the app disappears that line and again you have to create another. As the level increases, the blocks begin to fall down faster and let me tell you it’s quite challenging to survive for long. If you are unable to complete the full line parts and the block reach at the top of the screen.. you lose. You score will appear online along with your country’s name. As you open the app, you will find 4 options: Play, Settings, Records, and About. As you click on ‘Play’ button, you will first come across with the tutorial of the game that makes it simple to start playing the game. ‘Settings’ button lets you enable of disable tutorial, Ghost and change the language. ‘Records’ section shows you online records of Unites States and Global along with a list of offline records. It’s a good brainstorming block puzzle game app for Windows 8. Go ahead and download Space Tetris app in Windows 8 now. BlockStacker! 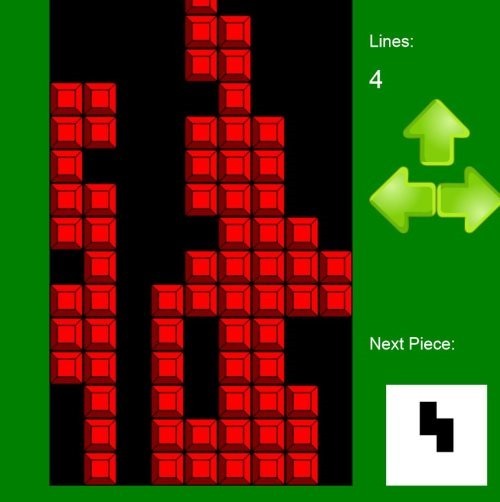 is a free tetris puzzle for Windows 8 where you need to create horizontal lines at the bottom of the screen using the blocks falling from the top. Each successfully created horizontal line will clear out automatically and you will get points as a horizontal line disappears. You can easily use your keyboard arrows to move the blocks between left and right. The up arrow in your keyboard can be used to change the orientation of the block. It’s a good entertainment yet challenging app. Go ahead and download BlockStacker! app in Windows 8 now. It’s a new style of playing Tetris. 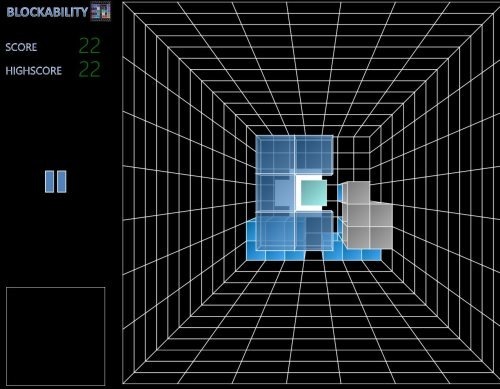 Blockability 3D is a free block puzzle app that extends the concept of Tetris to 3D. It begins with very low-speed 3D blocks and as you survive for long, the it takes the level up and the speed of falling blocks gets higher. Your score and high-score are given at the top left corner. You need to move and rotate the blocks to fill them up in the box. Once the game gets over, your score are displayed along with an option to play again. Blockability 3D is an excellent time pass for intelligent people and for those who love challenges. Go ahead and download Blockability 3D app in Windows 8 now.